The last time I was in Seattle, I’d gone to a local sushi chain spot, Blue C sushi, and gotten a roll that I absolutely fell in love with – the V8 roll. Since there was one near the local mall, I got some to go one night for dinner. The V8 roll is a thing of beauty. Your standard nori and rice, but with deep fried green bean, carrot, and cucumber in the middle, topped with avocado, basically what is a variant on pico de gallo, and a spicy sauce. 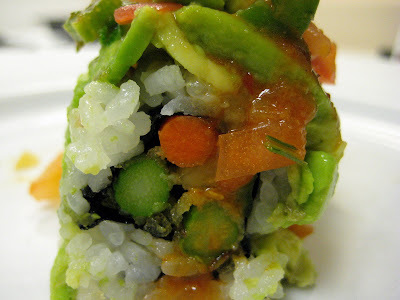 It’s completely vegetarian, and is like a cross between veggie sushi and mexican food. And oh what a perfect combo it makes. Blue C in and of itself is only ok, but this roll is just about the best thing ever. I could eat these all the time. ALL. THE. TIME. I love the V8 roll. They don’t have it anymore and my heart is just shattered! I love that roll, I’m jealous!